Our panel at SXSW Interactive seemed to be a success. While I feel very comfortable preparing and delivering a solo or duo presentation - this was my first panel, either as moderator or panelist. I worked on synthesizing good and bad points from other panels I had experienced. They are often primarily mini-presentations rather than discussions. 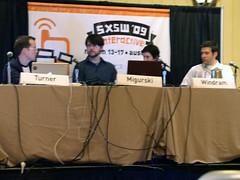 Our panel met up twice at SXSW before the actual session and each time was very relaxed with interesting discussion. So much so that I had to cut them off to save the "ah-ha" and "oh really?" moments for the actual panel itself. In preparation, I had each of the panelists send me a bio, their thoughts on a couple of questions, and to gather links of example sites or tools that we could show off during the session. In addition, I prepared a series of talking points that I wanted to cover, various bullets on sub-points to cover, and an overall goal. Outside of the panelists, other people submitted questions via Google Moderator and emails that helped provide different viewpoints. All of these preparations served very well, though I learned a few important points for future panelists: Prepare a clear, definitative first question. In spite of my well layed out series of bullet points, a short overview and introduction to the topic, the moment I turned to the panel to ask the first question it slipped out of my head. Another lesson was that while having a good set of links prepared to show, it distracts from the conversation itself and turns into a small demo-fest. It would have been better to leave the links for people to discover on their own and focus on the discussion. Other thoughts on how to run a good panel were logistics imposed by the conference itself. During our preparatory meetings, we would sit around a table, face one another, and it would be a very natural flow. Body language and eye contact has a tremendous impact on connecting with a speaker and allowing for a multiple-person discourse. By contrast, panelists sit at a flat table, facing the audience, and have difficulty seeing one another. They either have to turn their body awkwardly to face other panelists, or look to the audience and not notice the panel. For a better panel, like interviews, it seems better if there were chairs in a semi-circle and could easily see one another and naturally discuss. Wearing head or lapel mics would also create a more natural feel and better discusion. During the panel, I monitored Twitter for "neocarto" and "neocartography". Most relevant messages were about attendees having difficulty finding the venue (it was located in the Hilton instead of the Convention Center) as well as waking up late (10AM on Sunday). Another request that several panelists made was to encourage the audience to ask questions at any time during the panel. The first question didn't come until about 35 minutes, but once that bubble was broke - there were several others. It worked out fine, but retrospect, I would have planted a question with a friend to make sure and ask after about 20 minutes if no one else stepped up. The 60 minutes went really quickly. We definitely didn't get to each of the topics I was hoping to, though we did address the primary issues and questions raised other good points. I'll follow up in another post about the specific points of the neocartography discussion. I'm also at the American Association of Geographers next week on two panels - so it will be interesting to compare how those panels operate.